Recently Wiss has started watching a few films, and he had his first visit to a cinema to watch Despicable Me 2 a couple of months ago. He loved it, obviously! The whole experience was pretty awesome for him (especially the popcorn!) but he particularly loved the Minions. I mean, who doesn't? The thing about the Minions is that there are a lot of them. And I have to admit that I thought that they would look pretty cool en mass on our wall. However...I have since learned that although small children like repetition of many things, making the same thing over and over doesn't seem to be that appealing. Making these Minions did turn out to be a bit of a chore for Wiss (sorry darling!) so we made them over the space of a week. I actually think now that this craft would work much better with a group of children: each child could make their own or you could try to get a production-line going with one child doing one part. 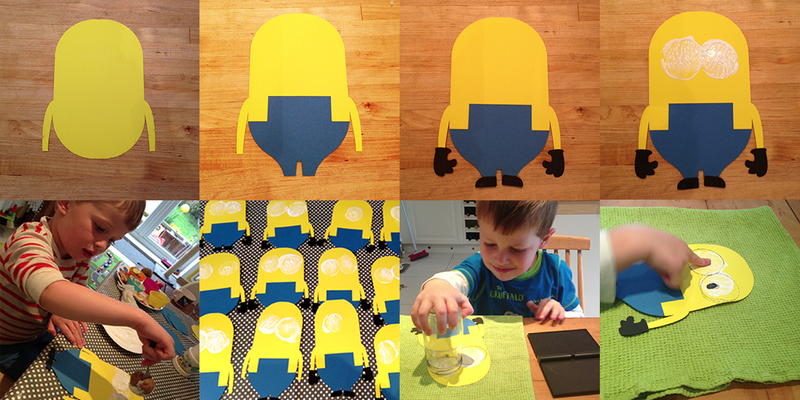 Anyway, we finished our Minions this morning and I have to say, we all love them and they do look pretty cool! I cut out lots of body shapes from yellow card, blue dungaree shapes from blue card, and gloves and shoes from black. Admission: I used a laser-cutter to cut out my shapes because I'm lazy and I have the use of one. But you could easily cut a few at a time by hand with scissors. Once these were dry we used an old jam-jar and an ink stamp to create the rim of the goggles. Wiss came up with the idea of using his fingerprint to make the eyes - and he had great fun getting them to look in different directions or look cross-eyed! For speed and ease we used blue electrical tape for the straps of the dungarees - I cut strips and Wiss stuck them on. 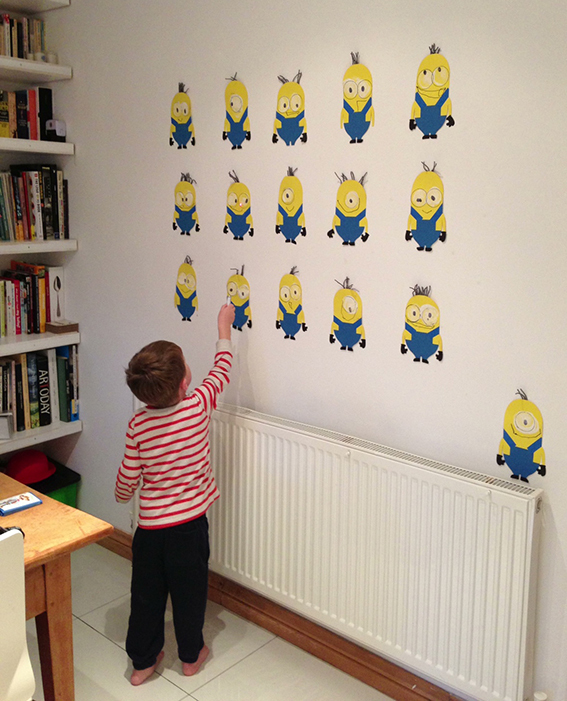 And the finishing touch was wool hair sellotaped to the back of each Minion. 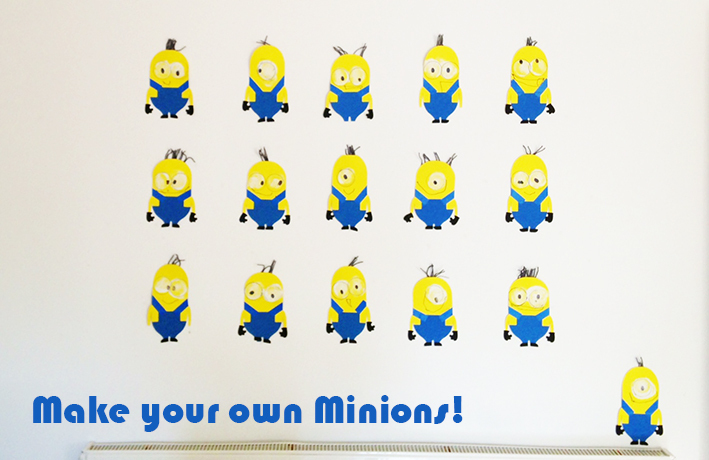 And there you have your very own Minion Army!